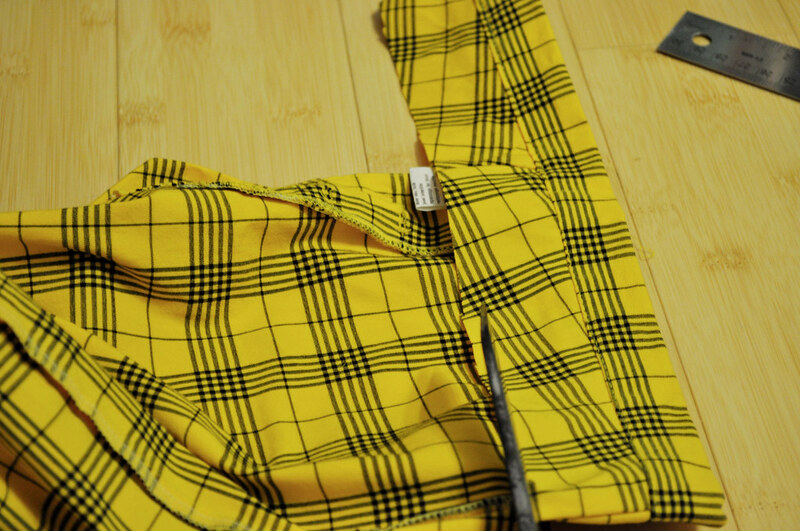 step 1: fold hem back, iron it down. 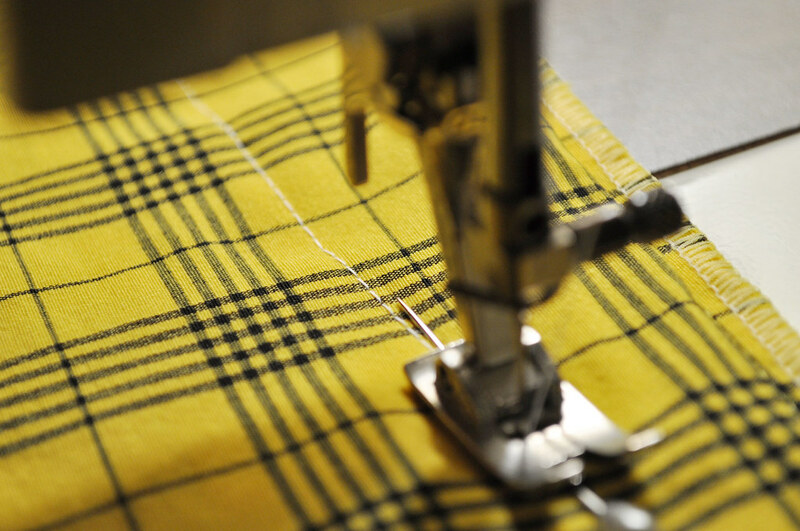 it makes it easier to hem. tie a knot at the end of the thread, but don’t make it a double thread. for hem’s, a single will do. 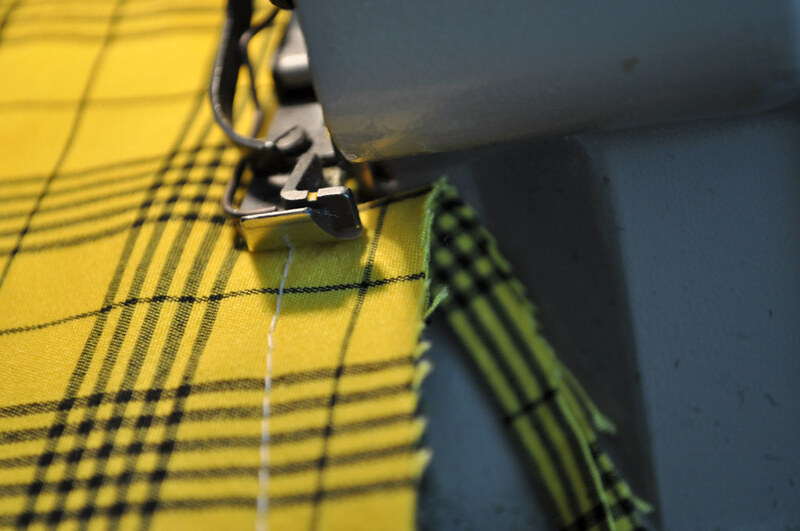 generally, you start at one end of the hem where the pant seams start. you also want to push the needle through the seam too, to make it more secure, so i technically made a boo boo on one leg. but that doesn’t matter cause i finished it that way. 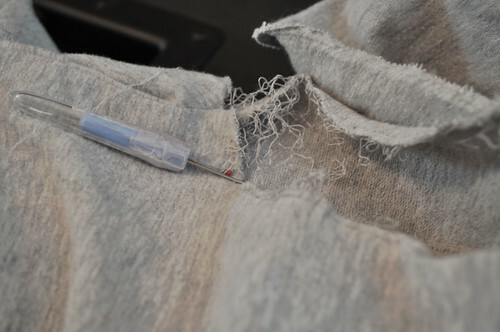 first you go onto the pant leg itself, which i have already done, and find a single thread of fabric to poke the needle through. this is a bit tedious at first, but it gets easier as you go. 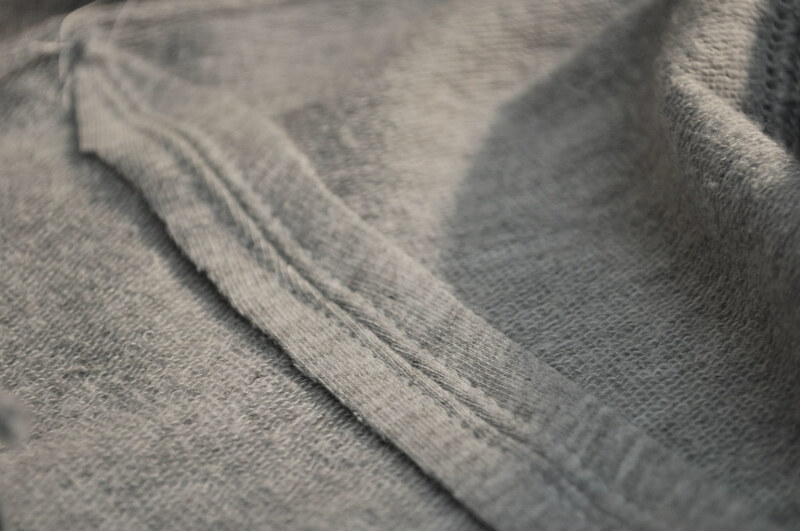 this allows the hem to be virtually invisible on the other side. alternate going from the hem side to the pant side. it’s pretty simple, but i’ve been doing these awhile, so let me know if you have questions. so i changed my mind. 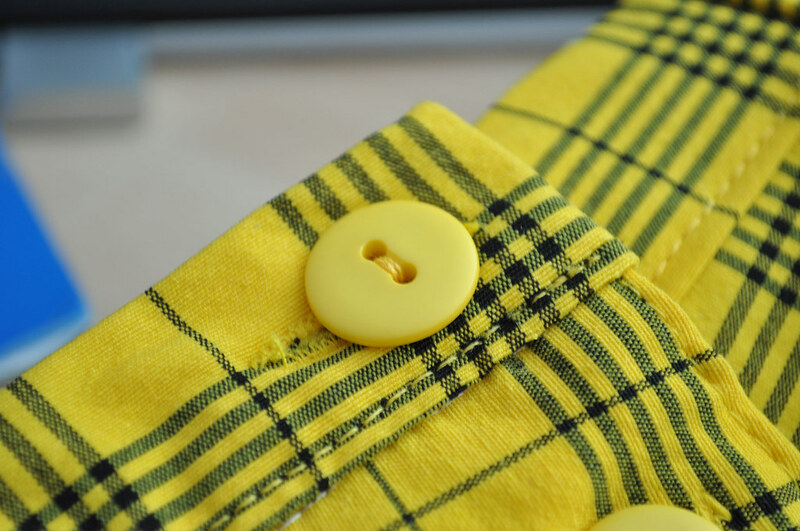 sewing a button is pretty basic, but there’s a couple tricks you might like to know. when you try on the pants, mark the place where you want the new button placed. 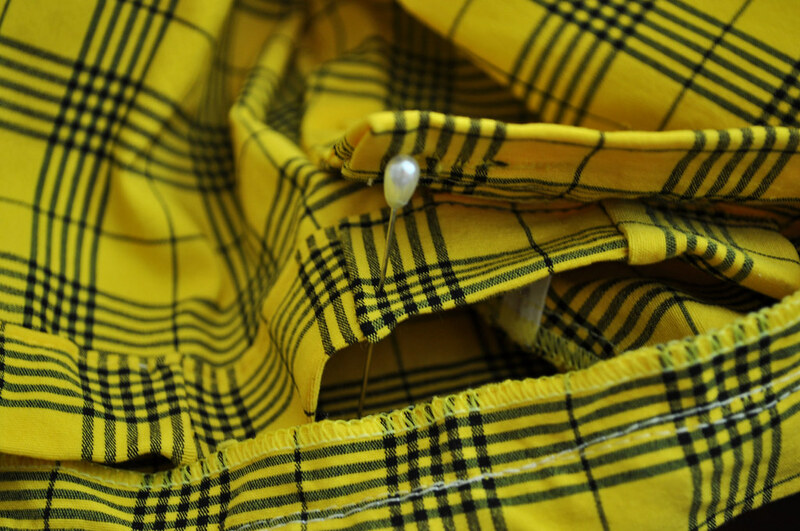 i chose the far end of the button hole, but i made sure it didnt make the pants pucker strangely in the front. this is a trick i learned from my mom for tying the end of a thread, single or double. 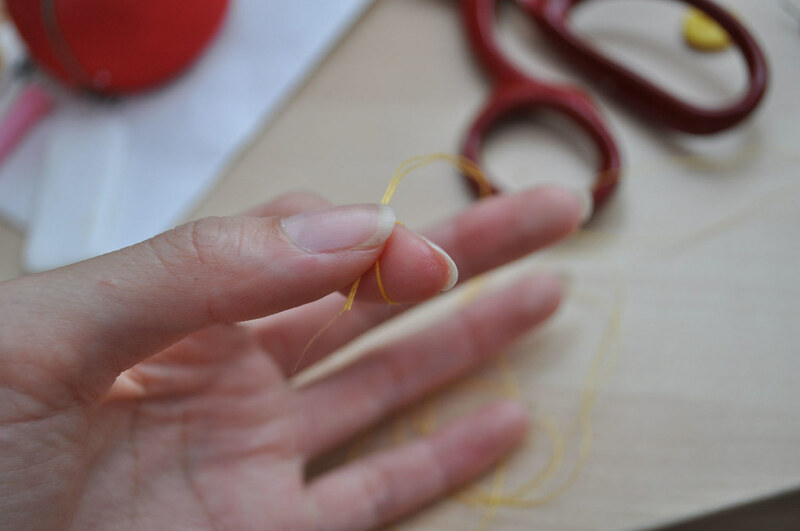 loop the thread around your finger and hold the crossed area between your thumb and your index finger. 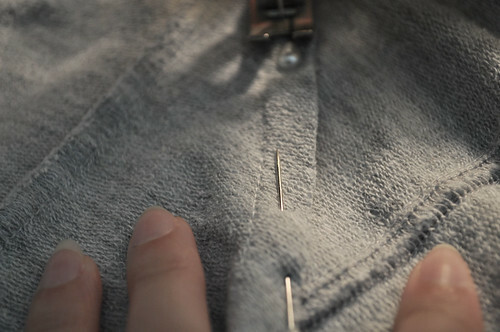 without moving your thumb, pull your index finger back so that it twists the thread around itself. pull the long end to tie the knot. it takes a bit of practice, but it definitely speeds things up. maybe i’ll do a video on this, its a bit tricky to explain. i did it three times and didn’t make the loops super tight. you’ll see why in the next step. 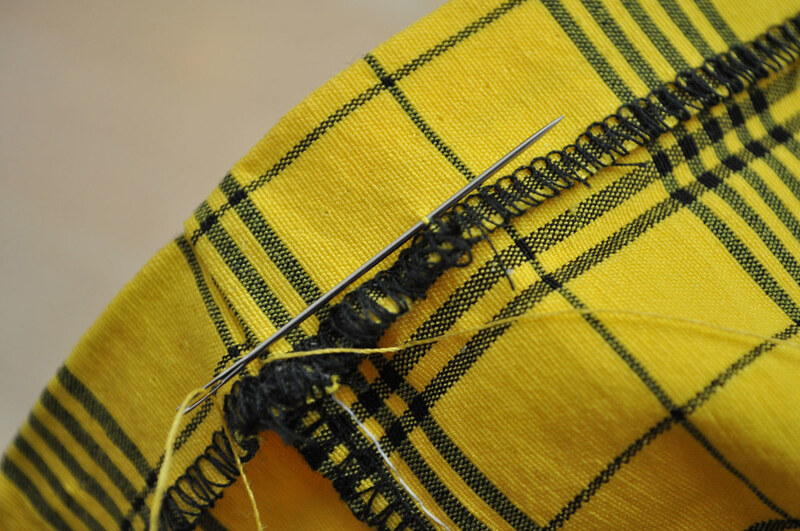 this is something not often done, but its important so that the threads are stable. on the last loop through the button, stop before you puncture the fabric. 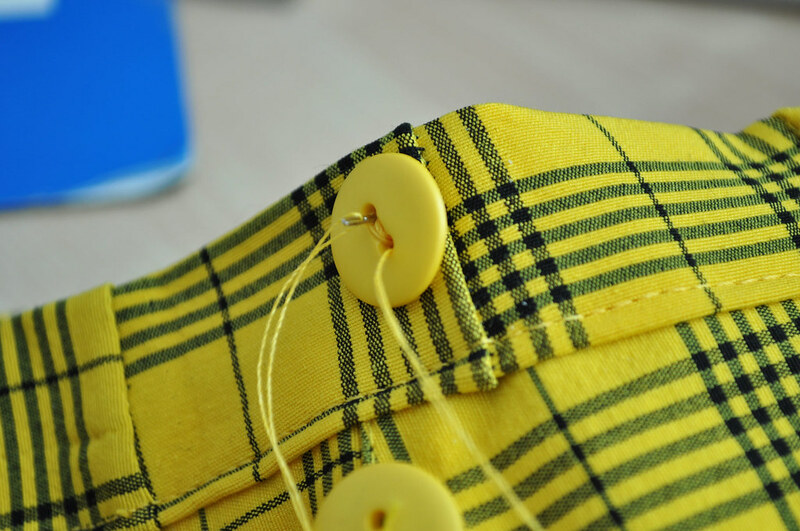 wrap the thread around threads underneath the button a few times. 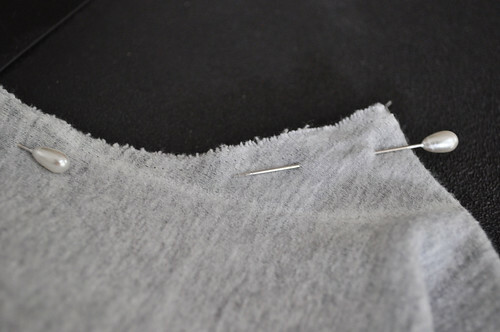 go through the button holes again and then puncture the fabric to finish. i accidentally did this without thinking, so now i’m doing this on a scrap piece. 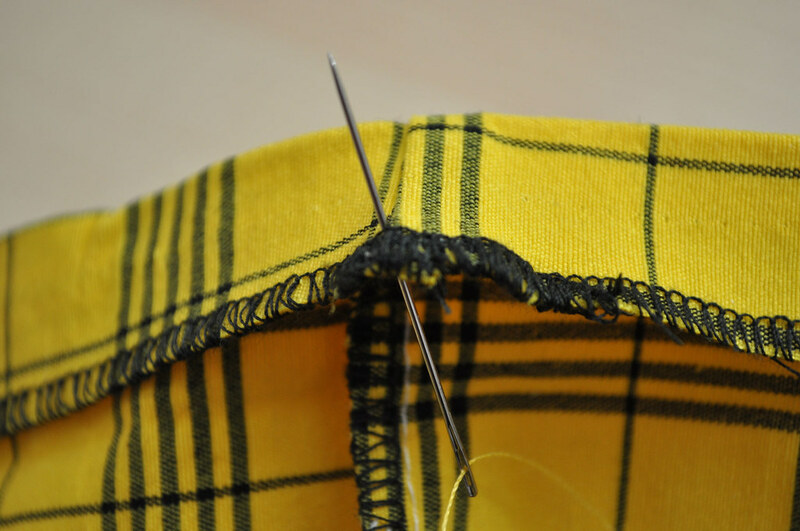 to make a secure knot on the back, use your needle as an anchoring point like in the first picture. pull the other end of the thread to make it tight. 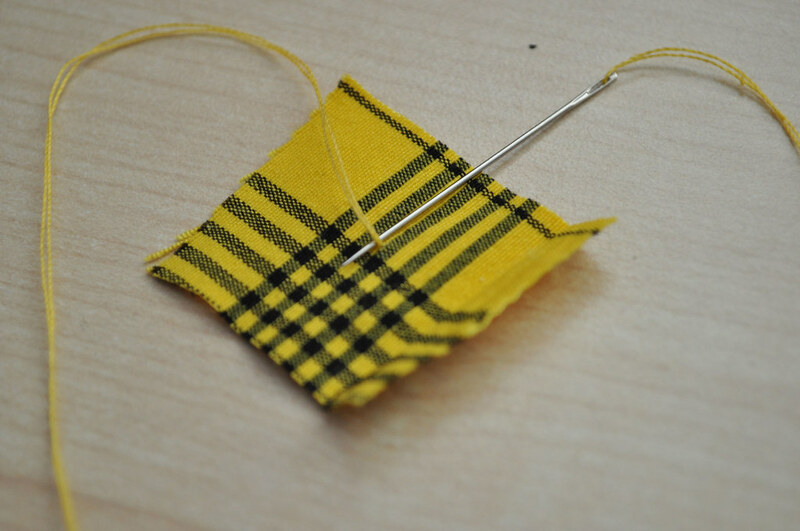 when the needle is pas the fabric, press your finger on the cross section and continue pulling through. 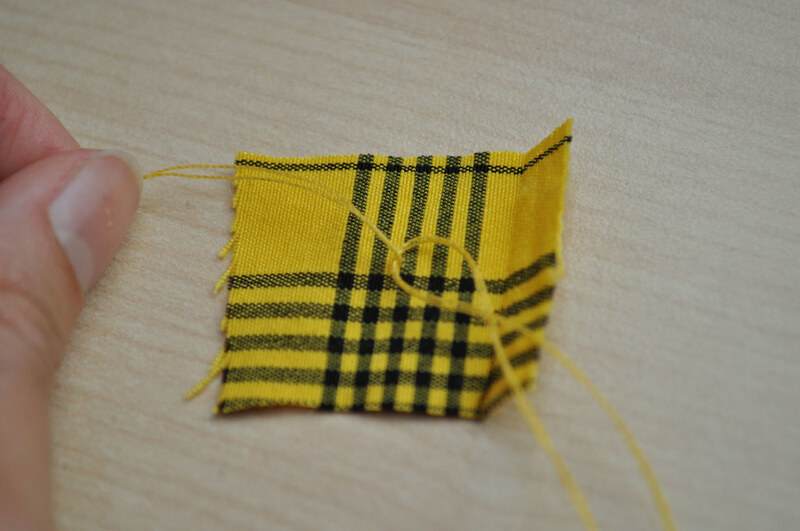 i tied the thread off after 3 rounds of this, but you can do more or less depending on the fabric. so the first problem being solved (the leg fit), the second problem with the pants is that the rise is too high. i almost tried to imagine them in their heyday, but i caught myself. luckily for me, it’s a bottom fly and easier to fix than a zipper. 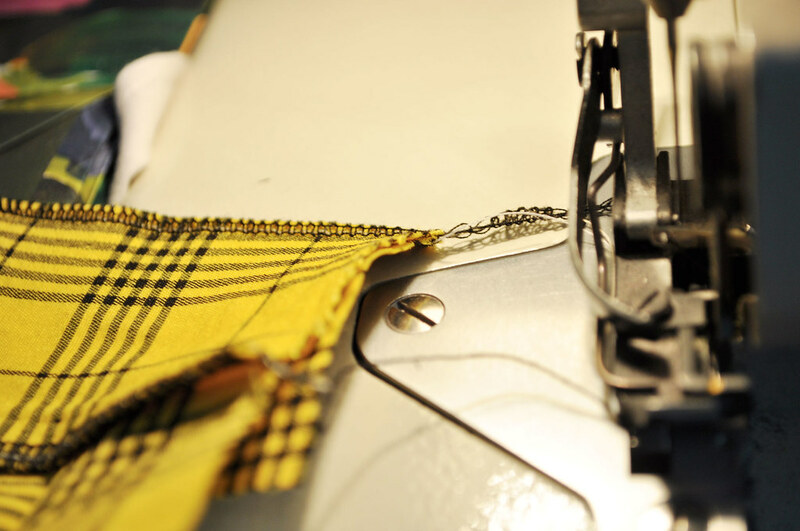 it involves cutting off the original waistband, the offensive excess rise, and refitting a new waistband. the photo is slightly incorrect actually because i measured 3″ out later, but you get the idea. 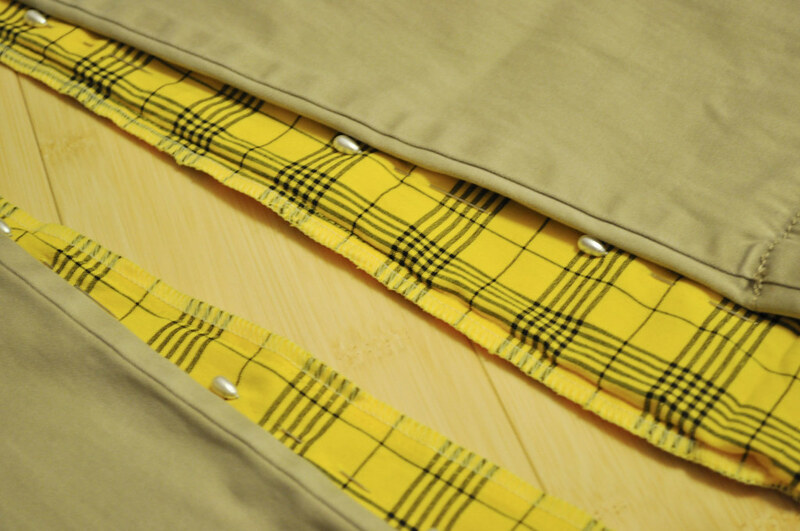 the waistband is a piece of fabric covering the top layer, but it also fastens. 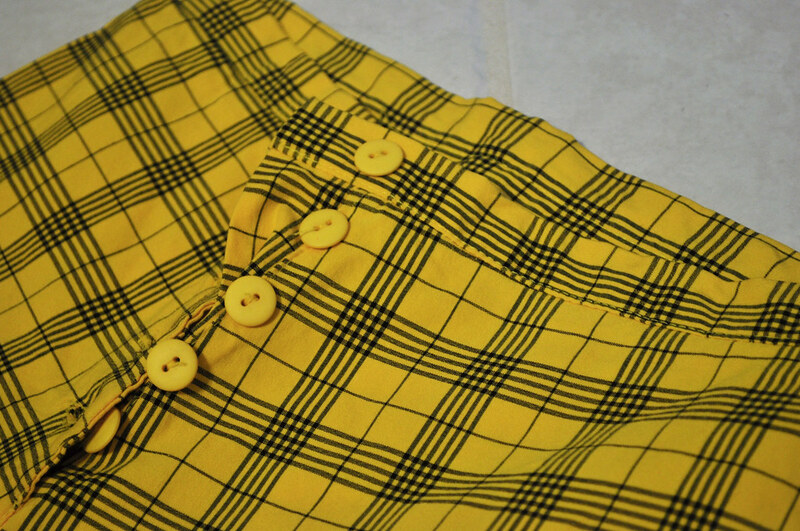 i measured down to the top of the 3rd button from the bottom (where i wanted my new waistband to hit). 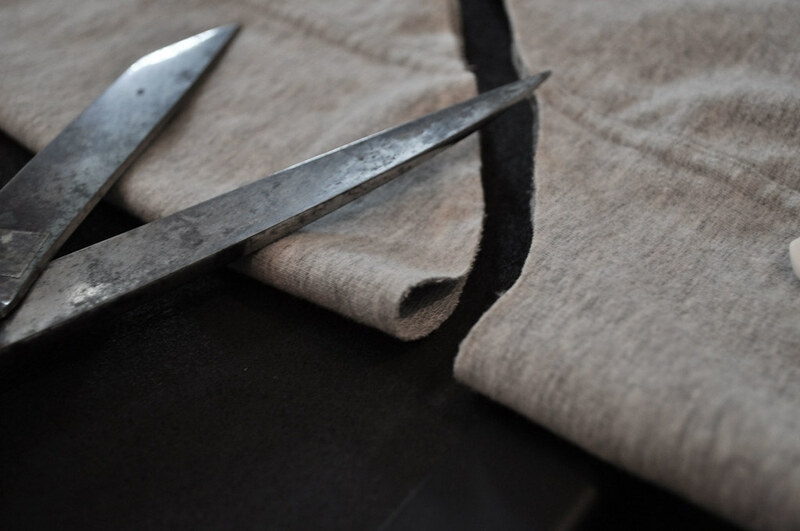 alternatively you don’t have to measure out all the way around the waistband: you can just align the cut portion over the uncut portion, folding and cutting as you go. the white portion you see there is the interface, to give the fabric more structure. keep that together with the waist band, you want it exactly as it was, just in a new locale. 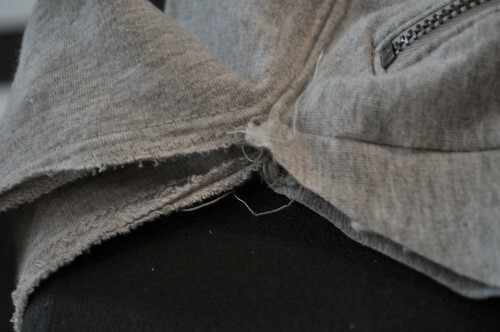 once the old waistband has been freed, repin them onto the pants (right side out). 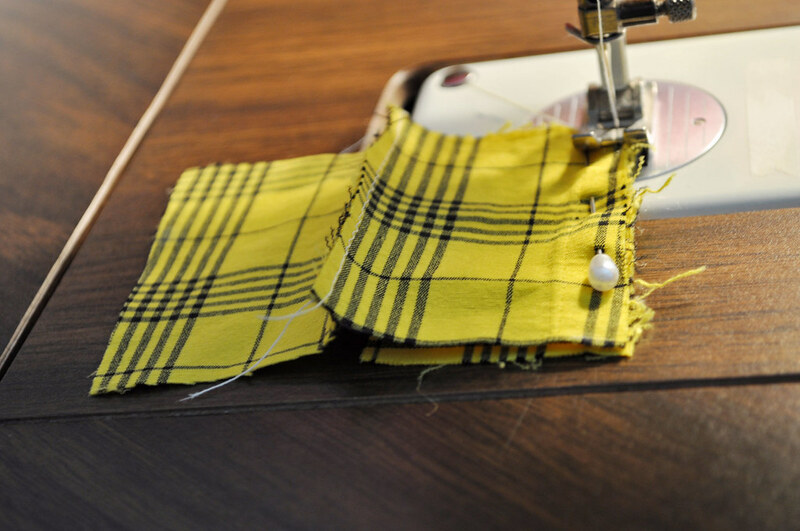 there is a portion of the waist band that folds over, so to recreate that evenly, fold the waistband in half over the pants. then, fold half of that half back onto itself like shown. 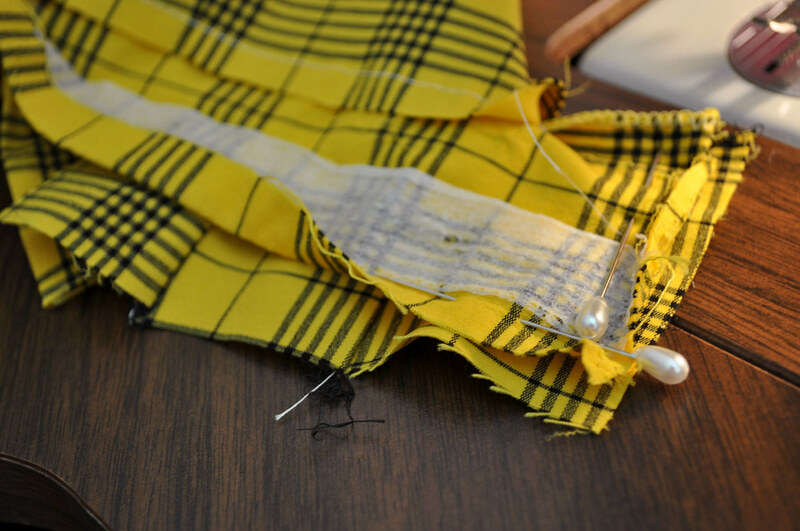 this will create a line for you to follow pinning the new waistband along. as you’ve probably gathered, the new waistband is a bit short in length. 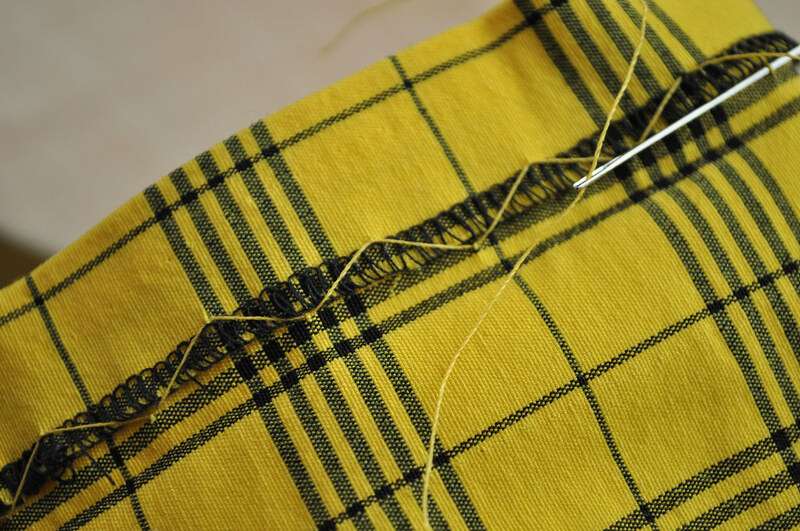 what you’ll do in a later step is extend the pants but cutting up scraps of the rise and sewing them on. i neglected to photog this part, but its pretty self-explanatory. 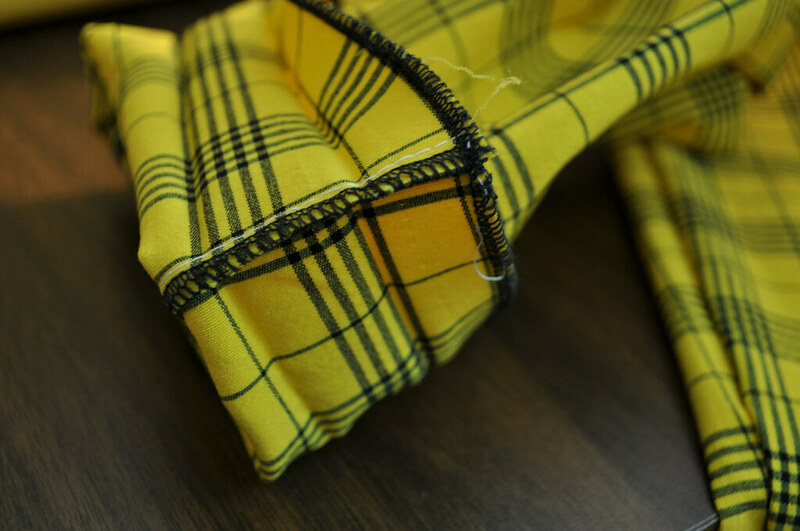 do not go all the way through the unfinished part of the waistband, you need to save enough room to be able to sew on the extended piece. 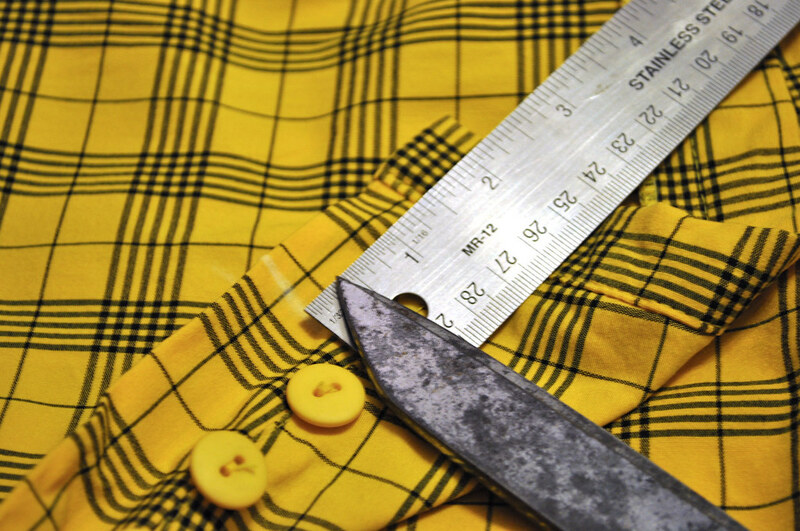 measure out how much more of the waistband needs to be covered. 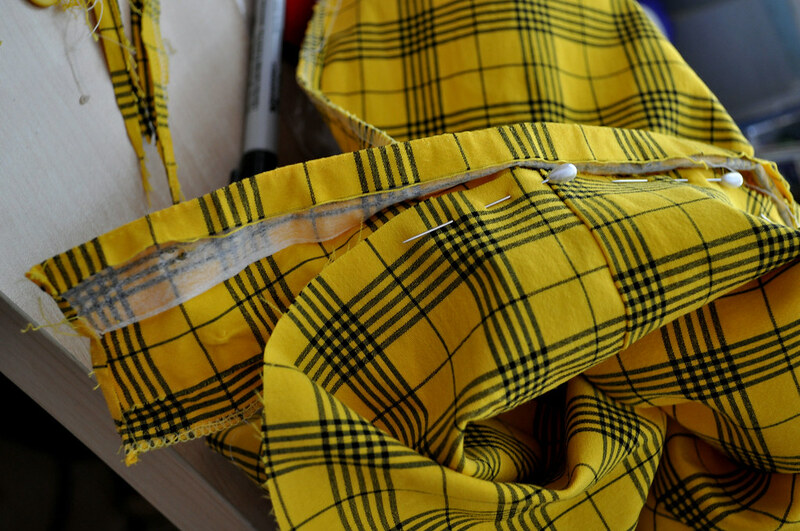 use scraps of fabric from the rise and make sure the length fits the bill and the width is the same as the waistband currently attached, in order to match. in my case, i need 3 scrap pieces. isn’t it bootiful? i love serging, it’s both scary and satisfying at the same time. but that’s neither here nor there. 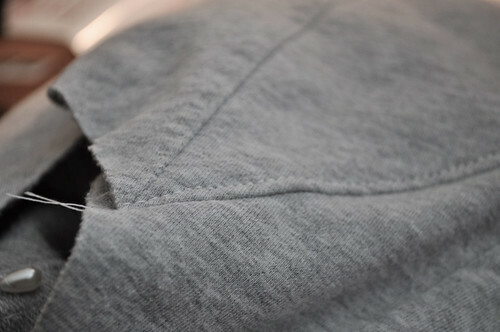 make sure all the seams are on the inside when you fold it over. your work should look something like this. 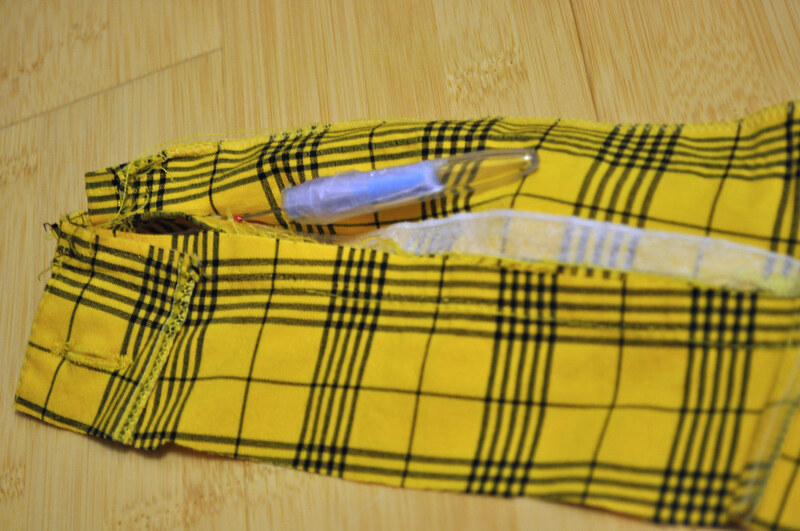 you can new reattach the rest of the waistband until the pants are covered. so that is covers the other seam where the waistband is attached. 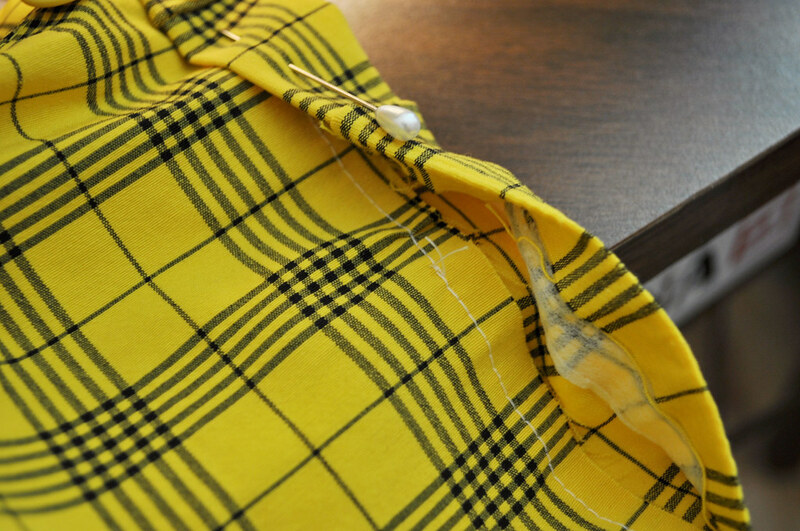 this seam will show, so use a similar colored thread to the fabric. 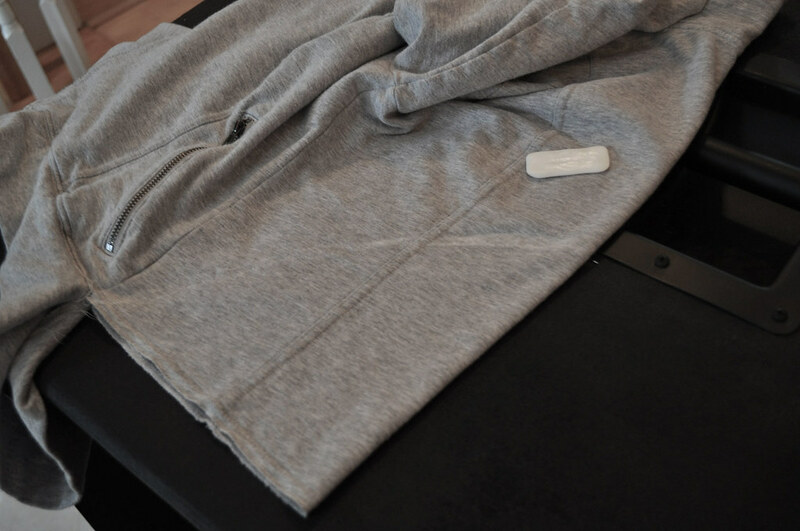 you’re probably wondering about the seams on the extension piece: doesn’t it disrupt the waistband? for me, these pants have a busy pattern and i’m not really planning on wearing them to dinner parties so i’m not too worried about it. 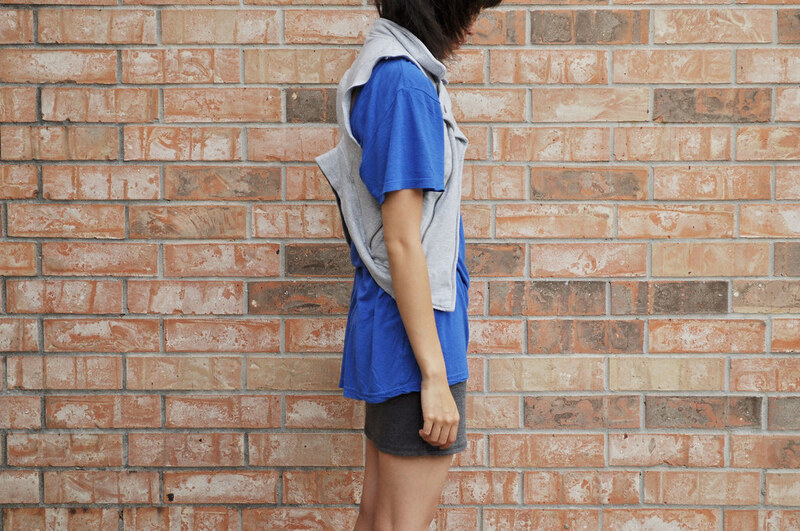 if you’re more concern about this, you can put the extension between belt loops in the back or on the sides. you just have to the remove the belt looks beforehand. 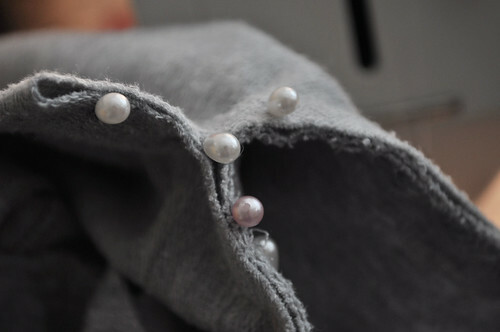 alternatively, you could cut out a new waistband from another piece of fabric. just be sure to cut on the bias so that it folds and curves when sewn, otherwise weird puckering will happy and that’s no good. questions? let me know! i’m still relatively unsure how much detail to put or pictures. help me help you! i’m a thrifter and sometimes i just find things that are only half perfect, but half perfect is enough. when i saw these, it instantly recalled to mind these punky babies from awhile back. they’re a great fit, but there were two major issues with them: 1) the rise was above my belly button 2) bottoms were horrendously flared. i’m a big fan of altering, as you can tell, so for $2.50, i was willing to invest some time into these. 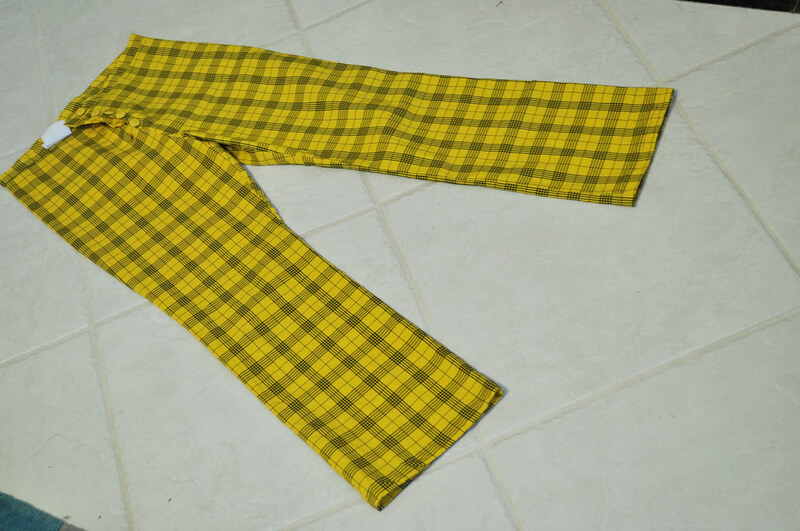 these pants are actually the perfect conduit for showing how to alter pants, so i will be doing them in 2 installments. the last two steps are pretty basic things, so i decided it was more trouble putting up than its worth. if anyone really really wants to know, i’ll post something later. i was starting to get really sick of plaid on the screen. 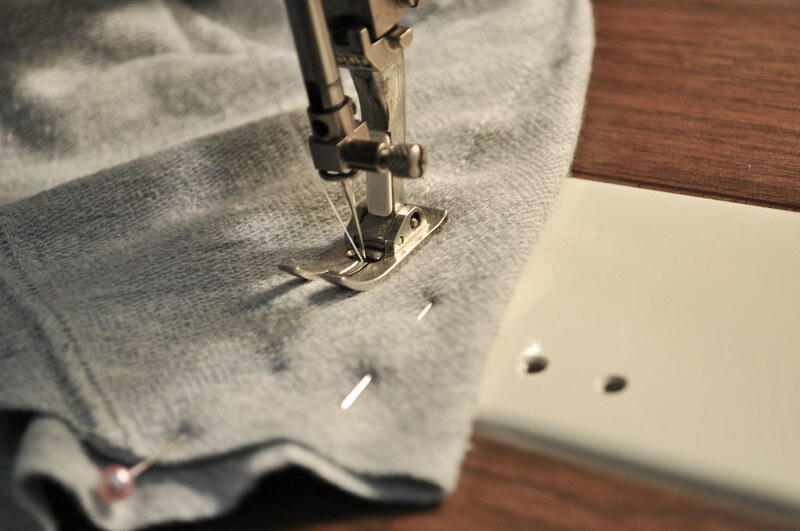 technically, the first step is to undue the hem of the pants. you’ll have to rehem them in the end, but that’s a later installment. 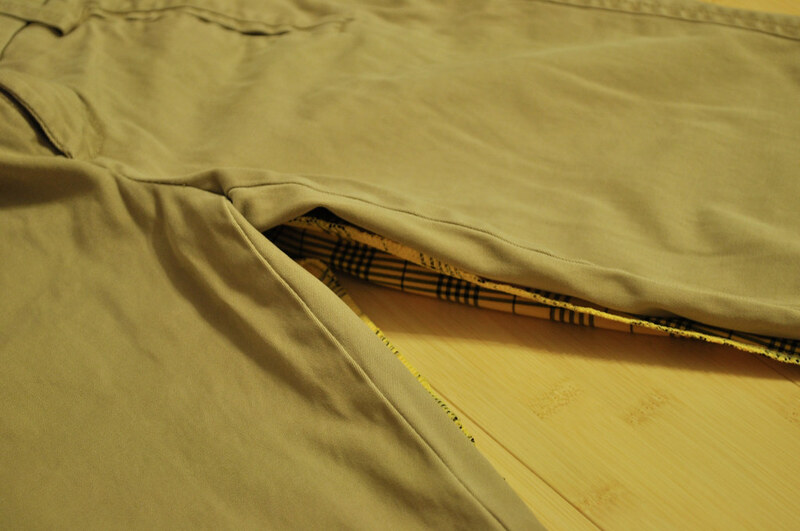 i wanted the pants to have a slim/straight leg fit, so i chose a pair of my khaki pants that have a similar fit. try to choose a pair that have the same amount of stretch. line up the crotches (teehee) and then you center the slimmer pant legs on top of the other. pin the new pant seams using the other pair as a stencil. 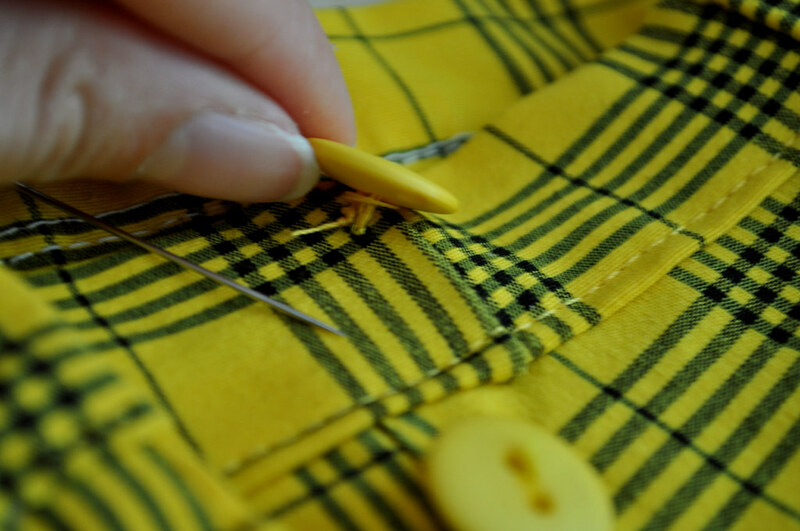 sew along the pins and remove them as you go. try them on again inside out and refit them if necessary. i pinned the length of the area that needed to be slimmer and drew it out with some dried soap. 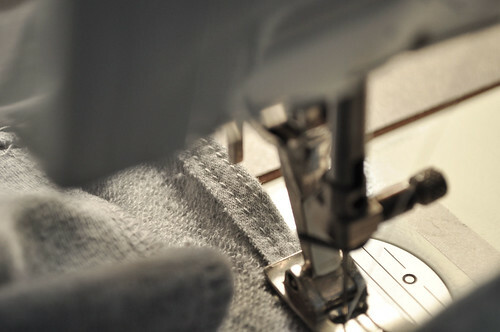 repeat the sewing process. 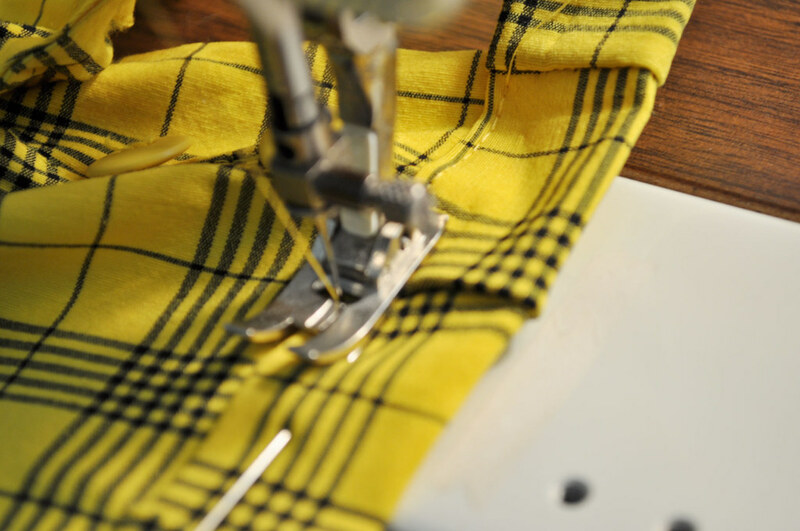 a serger creates a nice finishing seam by cutting off excess fabric as it sews. to finish off the pant legs, iron a new hemline and hem those suckers up. 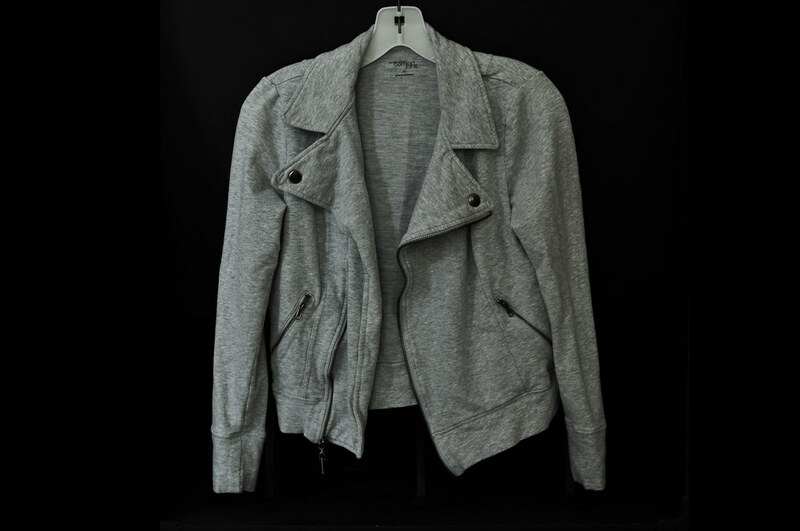 this is a perfectly cozy moto jacket sweater but it was never exciting enough for me. it lacks the bells and whistles of the real thing: the belt, the buckles, the hard-edged zippers, LEATHER, so i’ve been wanting to turn it into something more sculptural. here’s how i did it and it’s really not terribly hard; it just takes a bit of patience. and love. lots of love. first, i undid the seams of the bottom band in the back and one sleeve. feel free to do both sleeves, but i ended up liking the asymmetric look better. i chose the end of the arc to be in the middle of the jacket, so i folded it hotdog style first and made a mark. then i folded it hamburger style and marked the rest of the arc. if you don’t have tailor’s chalk, or chalk period, a bar of old soap is perfect. in fact, i prefer it because its free. bahahhaha. 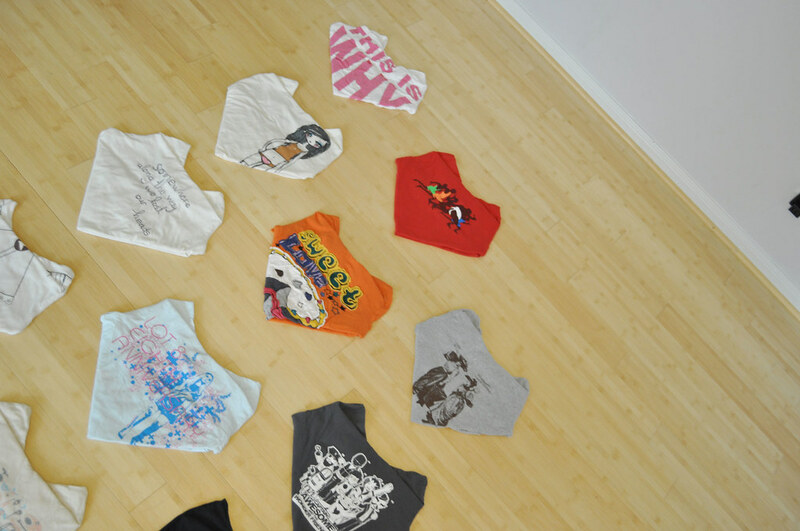 this step is pretty crucial and may take some trial and error to find the right fits. if you notice, the bottom is too short to reattach because of the length of the arc made, so how to you make it fit? you shorten the arc! if you notice on the right, i’ve folded up about an inch or more of the fabric in a triangular shape, where the hypotenuse is the side on the table and the short leg is the edge of the arc. 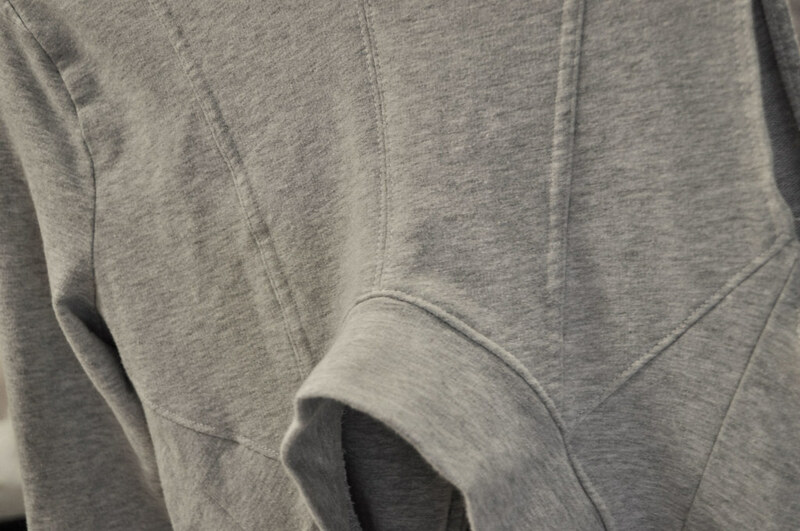 it needs to be a triangular fold and not a parallelogram because you don’t want to create weird puckering underneath the armholes of the sleeves (if you choose to keep them) or shorten the armhole (if you omit them). line up the short leg along the edge of the arc as you’re folding/fitting so that it stays even. i did two going towards the arm holes and another right down the center back. alternatively, you could just do one down the center, i just chose to do 3 because i like the way it looks. skip to step 7 if you’re only doing one fold. only sew the inside and check afterwards to see that everything still lines up. mine actually doesn’t line up perfectly, but it’s ok because it gets sewn over with the bottom piece. 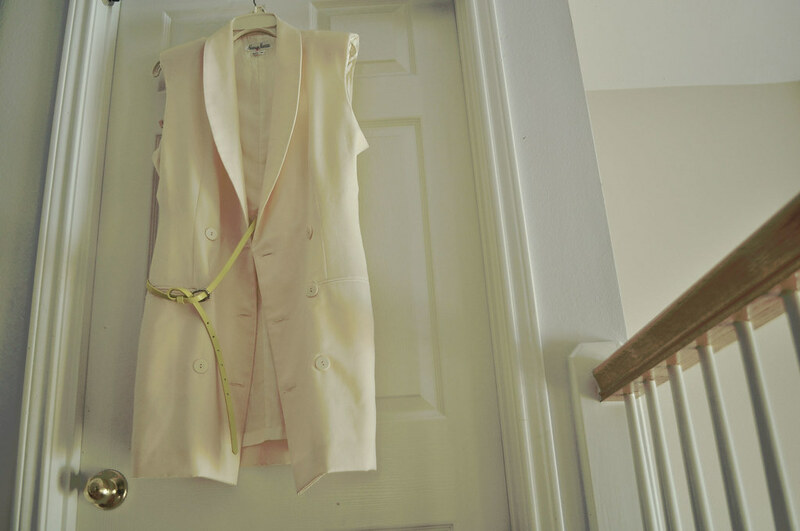 fold over one flap and sew again onto the jacket back, with a little bit of space between seams so it looks like the photo on the right when the jacket is worn. 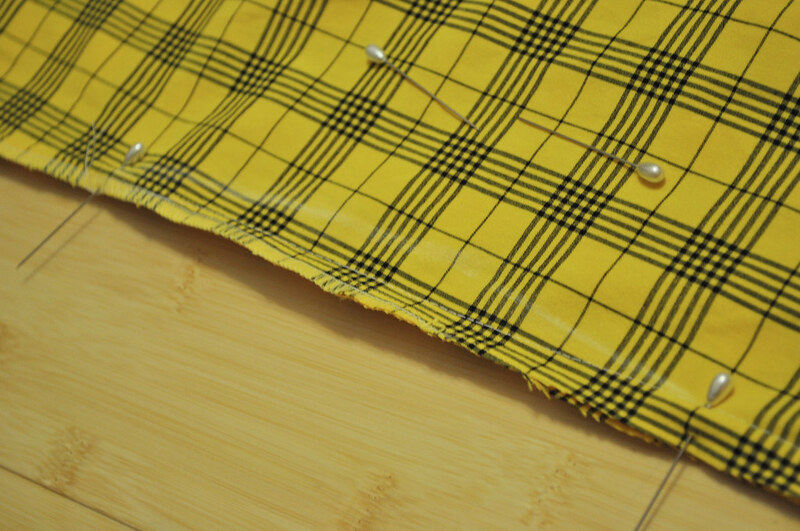 i did this to keep the new flap in place and it matched the seams on the jacket. 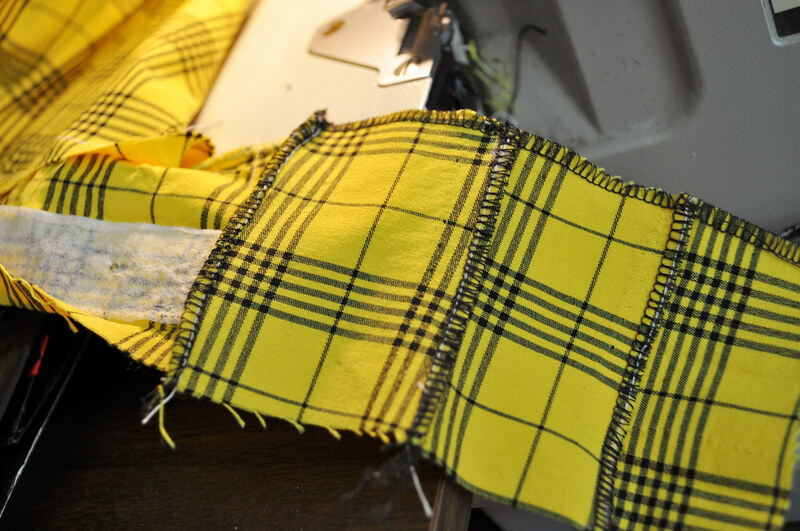 you could finish it with a serger before this step, but i chose not to. this is where you make sure the refitted back is the same length as the bottom piece. 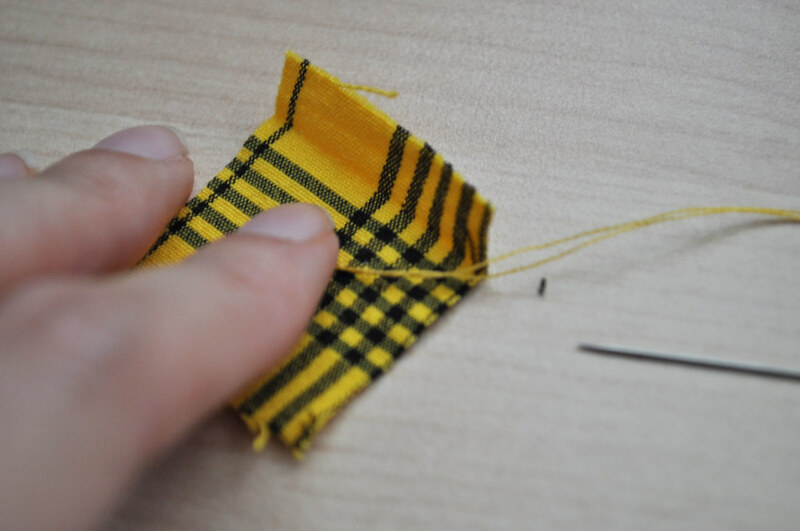 pin it as close to the center as possible and make the final triangular fold down the middle. 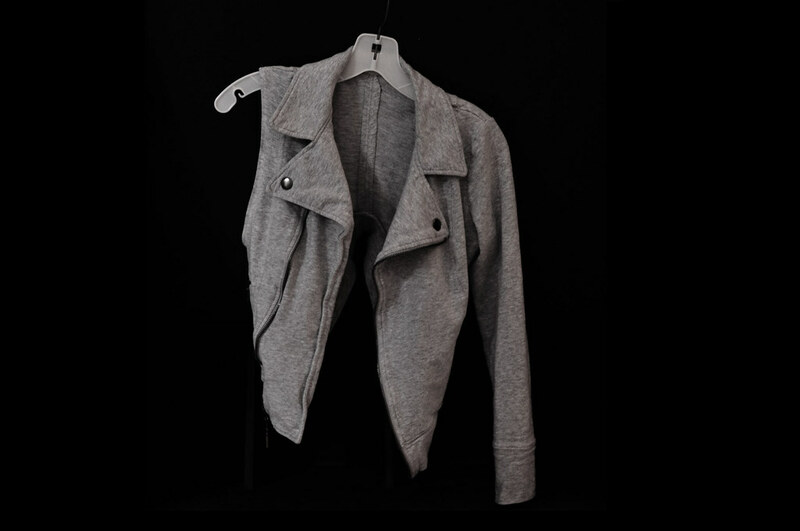 it helps to fold the jacket in half to center it. you could mark all of this, but i like eyeballing. i don’t really know why. maybe because i’m lazy in odd ways. this goes with the design and will keep it from breaking . 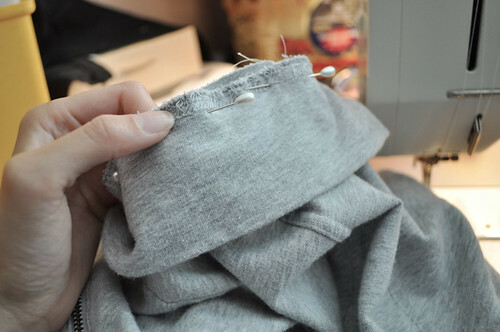 alternatively, you could just use a serger over the new seam and skip this step. here are my results of the outside, after i’ve sewn on the bottom hem. i did the seam for the bottom the same way i did the triangular flaps. 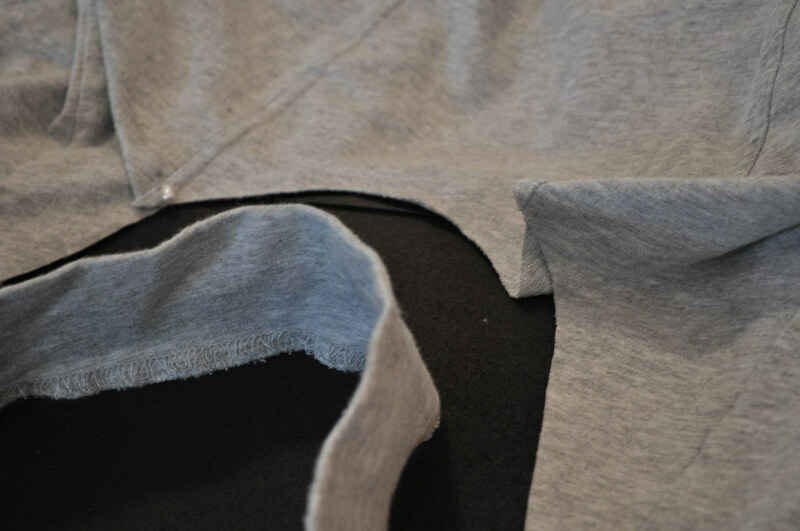 i made the armhole a bit larger, folded it over about a cm, repinned, and hemmed it with two parallel seams. please let me know what if you have any questions or if i need to be more clear about some steps! DIY tutorial post for this coming up! haven’t done one of those in ages.